Few corporate change initiatives offer the direct benefit to a company’s bottom line as initiatives aimed at their sales departments. A well performing sales department provides companies with consistent streams of revenue for supporting all other departments. Change initiatives involving conscious business practices also hold this promise. Unfortunately, most companies that invest in conscious business implementations don’t include it for their sales departments. These companies are squandering a great opportunity to generate the most revenue from their investment. What exactly is Conscious Capitalism? It’s a set of values for fulfilling the innate potential of business to make a positive impact on the world. There’s an organization called Conscious Capitalism www.consciouscapitalism.org. It’s dedicated to helping companies fulfill the values they refer to as, “the four pillars of conscious capitalism.” These four values are: Conscious Purpose, Conscious Culture, Conscious Leadership, and Conscious Stakeholder. Including sales departments in a company’s conscious business implementation is a no brainer. The word “conscious” within the term “conscious business” refers to an awareness that both companies and employees share toward one another in a conscious business culture. This awareness provides the basis for the pillars of Conscious Capitalism such as conscious leadership and conscious stakeholder. When companies include salespeople in their conscious business programs, this awareness extends to their customers. Salespeople are oftentimes the only company representative customers will ever be in contact with. There’s more to customer awareness than just stating it as a company value. It’s an essential component for a salesperson’s performance. Salesperson performance improves the more salespeople learn. How well they learn depends upon their level of awareness. Conscious salespeople are as comfortable being learners as they are being teachers. A conscious salesperson’s classroom is the conversation he or she is having with the customer. During this “class,” salespeople learn about their customer’s beliefs, values, priorities, challenges, etc. Learning this gives salespeople the information they need to assist customers in making more conscious buying decisions. In this way, conscious salespeople and customers work together more as a team rather than as adversaries. After all, when potential customers seek out a salesperson, it’s because they believe consulting a salesperson will help them make a higher quality decision. When salespeople and customers have a team-member relationship, the selling experience becomes more enjoyable for both. This improves a company’s bottom line in many ways. In terms of sales staff benefits, salespeople will experience less stress. There will be a reduction in salesperson absenteeism. Salesperson turnover is reduced. Less salesperson turnover means the company saves costs involved with training new salespeople. Less turnover also means the long term relationships salespeople develop with customers can be maintained. In addition, salespeople who are more content reflect better on the company. They’ll be more motivated and more productive. When sales departments value customer decision quality, salespeople will devote more attention to it. As a result, they will be more productive. This is because the salespeople will become more customer conscious. One reason customer conscious salespeople are more successful is because their goals are clearer. The real goal of selling isn’t to sell for the sake of selling. The real goal of selling is to achieve buying. A salesperson’s success is ultimately determined by the customer’s buying performance rather than the salesperson’s selling performance. Less conscious sales departments will be more focused on salesperson performance. This is the consequence of traditional sales department cultures that aren’t committed to conscious values. These cultures cultivate fragile egos, which leads to salespeople exhibiting defensive behaviors. A defensive salesperson will be more self-focused. 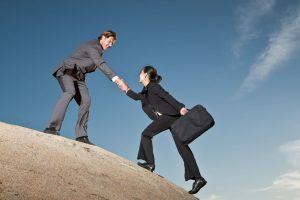 In fact, many traditional sales departments introduce motivational programs that will appeal to their salespeople’s egos. Focus on oneself shouldn’t be the salesperson’s priority. A salesperson’s focus should be primarily directed toward his or her customer. When defensive salespeople don’t get the sale, their explanation is self-referenced. They walk away thinking, “I said everything the customer needed to hear, but I was talking to a bad customer.” This “self-focused” viewpoint impedes a salesperson’s learning. The salesperson’s focus is diverted away from the goal of having customers buy. Instead, they’re focused on the side-agenda of justifying what they said and did. When salespeople are self-focused they’re distracted from noticing and prioritizing a customer’s buying signals and receptivity. The result is lower sales performance and reduced salesperson skill building. The same problem persists even when customers do decide to buy. A defensive salesperson will attribute the successful outcome to his or her performance. The salesperson walks away thinking, “What I said must have convinced my customer.” In reality, the salesperson’s performance may not have been why the customer bought. Customers usually buy for their own reasons. I can personally recall many times that I bought a product for reasons the salesperson had no clue about. By putting ourselves in a customer’s shoes, we realize our decision process for buying is personal and internal. Salespeople often won’t know why a customer said, “Yes. I’ll buy it.” There’s nothing wrong with salespeople not knowing precisely why their customer bought. The salesperson’s goal has still been achieved. Sales success is ultimately determined by the customer’s behavior rather than the salesperson’s. There’s another important benefit for companies whose customers make higher quality buying decisions. These companies will have more influence over their customer’s buying behavior in the future. Customer conscious salespeople will learn more about their customer’s beliefs and values. Sales presentations can be modified to integrate with those belief and values. Buying decisions that are integrated with a customer’s beliefs and values will be of a higher quality. Customers will internalize these decisions and take more personal ownership for them. The customer’s decision becomes a part of who they are. Decisions that are integrated in this way will endure beyond a sales presentation. This is important because much of a company’s success relies on customers to act on their own after the salesperson has left. For example, companies must rely on customers to use their products so they can be used up. They must rely on customers to reorder their products. They need customers to recommend their products to others. They want customers to turn competitors away. They want customers to contact the same salesperson in the future when other decisions need to be made. Customers taking their own initiative on behalf of the company is a very important benefit. It’s enjoyed by companies that integrate their conscious business efforts into their sales departments. Conscious sales departments begin with establishing a “vales based” selling culture. They encourage commitment to values such as recognizing the importance of customer awareness and high quality decision-making. The self-defeating ego based defensive behaviors so commonly seen in traditional sales cultures have no place in a conscious sales culture. A values based selling culture improves salesperson learning and performance. Success builds on itself, generating additional learning and improvement. A conscious sales force will be a successful sales force. A successful salesforce is the back bone of a successful company. A conscious capitalism effort aimed at sales departments is an opportunity no company can afford to miss out on. I like this approach very much! Sales is one of the most devaluated professions with painful archetypes about it. This perspective dignifies the process and helps the sales people look at their task from an other point of view. More respectful and more realistic at the same time.